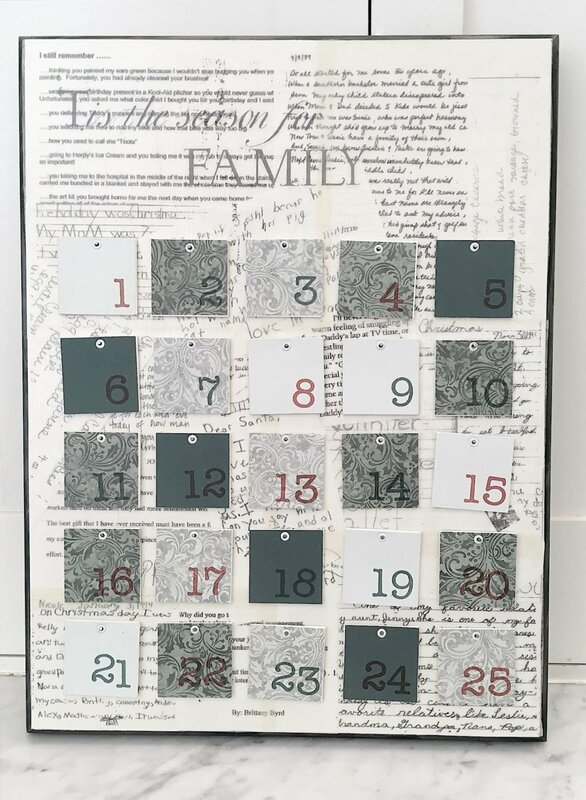 I originally saw a DIY advent calendar similar to this in Better Homes and Gardens and decided to make one of my own. 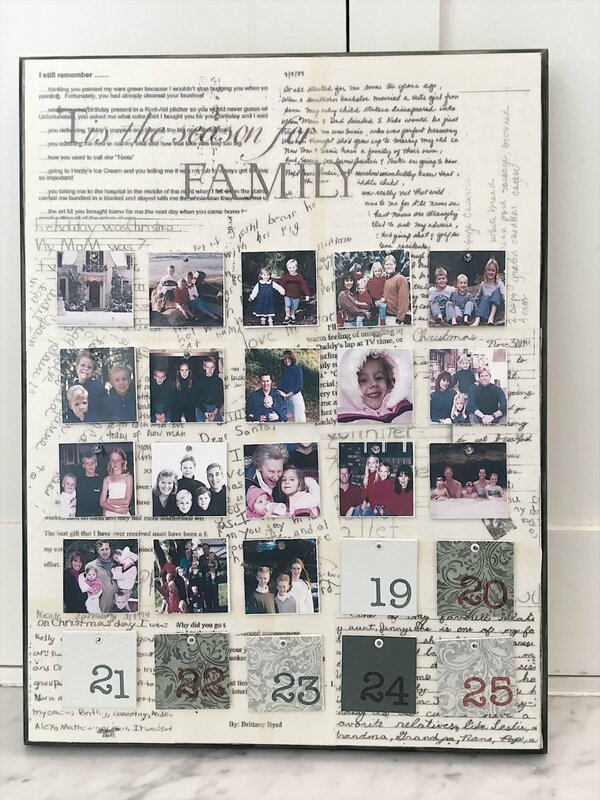 I first reached out to all of my siblings and asked them to send me copies of any family Christmas letters, recipe cards or anything that could be used in the calendar. 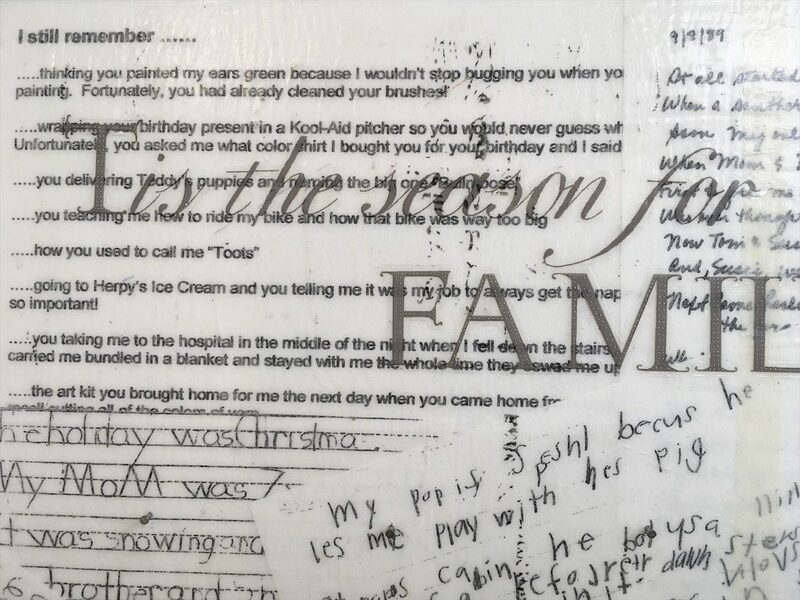 I also had them email me copies of family photos from their old Christmas cards. Remember, you will need 25 pictures in total. 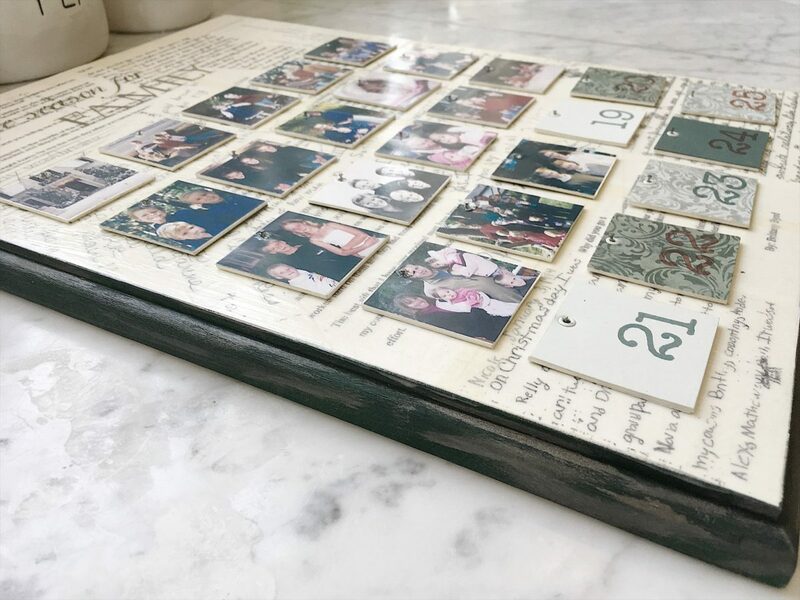 You can make yours using photos of your immediate family members, or any extended families. It’s up to you. Select twenty-five photos for your calendar. On your computer resize them to 1 3/4″ square. Print them out on the high-quality photo paper and cut into 1 3/4″ squares. Set aside. 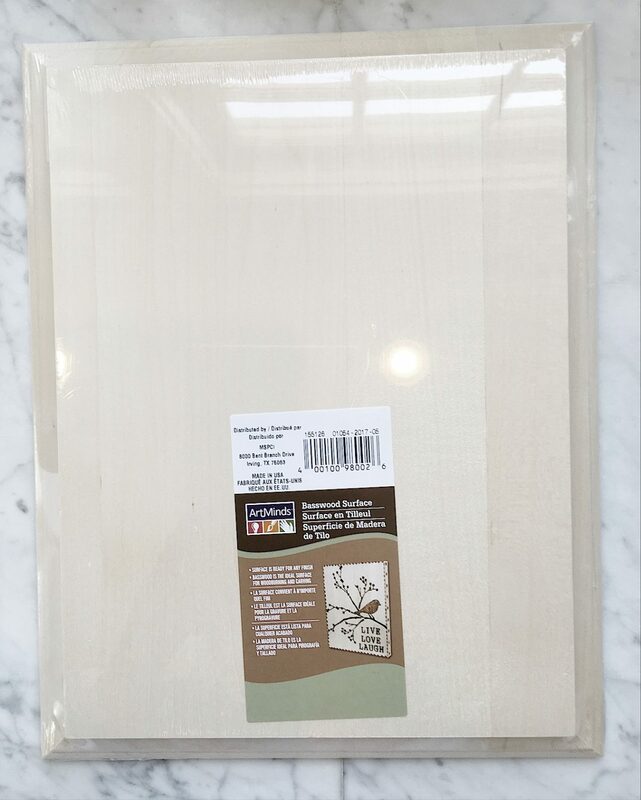 Paint the edges of your wooden plaque in the color of your choice. I used green and then added some silver on top for a slightly antique look. 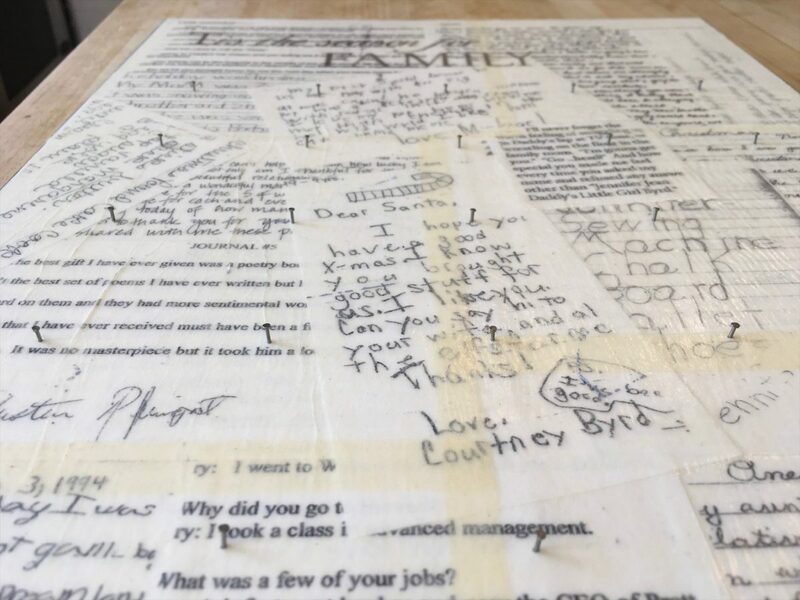 Make black and white copies of the letters and recipe cards and decoupage them to the board. You can also add rub on transfer letters in the saying of your choice. I found one that said “Tis the Season for Family”. Next, cut large squares of tissue paper and decoupage with Mod Podge on top of the entire surface of the wooden board. This makes it look vintage. You can see the edges of the tissue paper in the photo above. Cut 25 1 3/4″ squares of mat board. I talked the person at the art store into cutting them for me! Glue one piece of the 1 3/4″ square scrapbook paper on one side. Place the squares in five rows of five to make sure you have the paper designs in the random pattern you want. 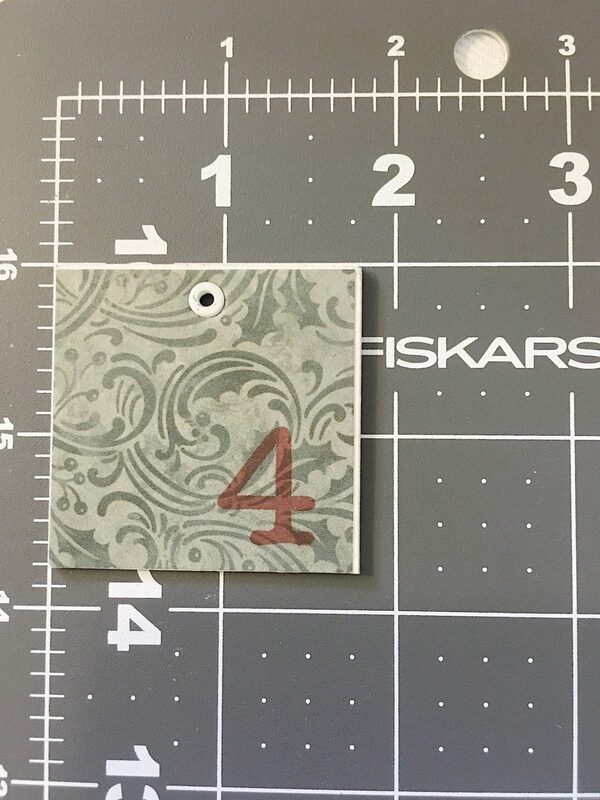 Using rubber stamps, add the numbers 1 – 25. 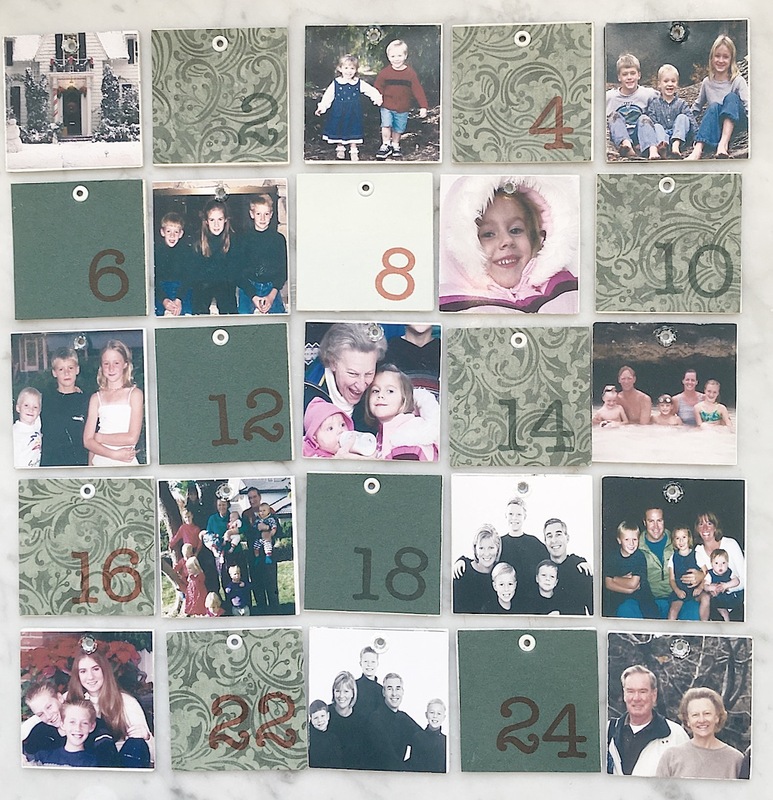 Turn all of the squares over and carefully glue one photo to the back side of each square. I chose a special photo for day #25 (my parents) which I just love! With a sharp pencil, carefully mark the center point for a hole on the numbered side of each square. It should be exactly in the middle of the square which is 7/8″ in from each side. I placed the hole 1/4″ down from the top. Using the Eyelet Punch, Snap tool and Maker, punch a hole and secure the eyelet in the hole. Make sure you always put the numbered side of the square on top when adding the eyelet. Next, mark the location of the five nail holes in each row. The first row of nails should be placed 4 1/2″ from the top. Each nail will be 2 1/4′ apart. The height of each row of nails is also 2 1/4″ apart. Carefully tap the nail into each hole until it is secure. Make sure there is enough of the nail sticking out to hold each square. When you are done hang each square on a nail. 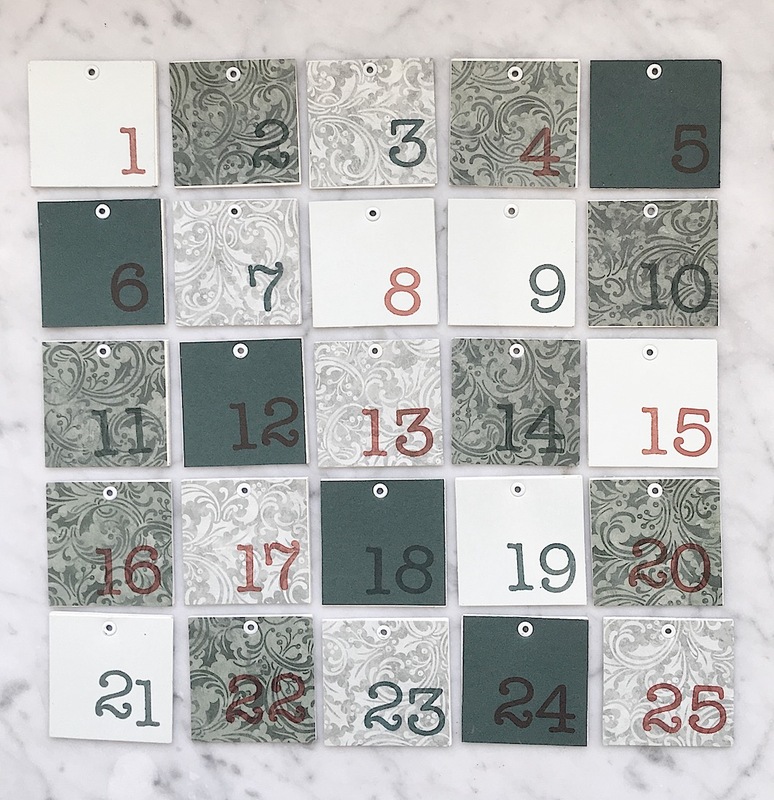 Enjoy your DIY advent calendar for the entire month of December! And many years to come. I know this looks a bit intimidating, but the end result is so worth the work it takes to make! And it really does make the perfect Christmas gift for family members. You can also make another one of my DIY advent calendars if you are looking for a two hour DIY. Happy Holidays everyone. This is SO amazing!!! 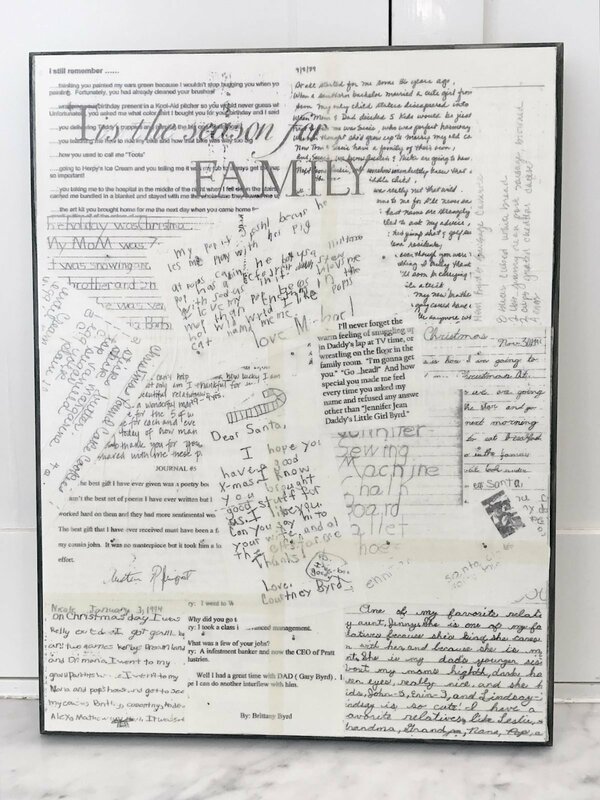 I am already thinking how I can make this & maybe gift it to other family members!!! Thank you so much for sharing!!???? Thanks, Kristal! That’s what I was thinking! My family loves this tradition, so I hope yours does too! This is so Beautiful, Thank You for sharing step by step with so much details. ???? Thank you! I’m so glad you enjoyed it! Tag me if you make it so I can see how it turned out!